From this, the documentary strings together the thoughts and experiences of young people and reflects their understanding of TB illness, how TB and HIV stigma is perpetuated and expressed, and the different ways in which people manage TB illness in their own communities. In doing so, their perspectives are highlighted and prioritised so that the story of TB illness is told from the point of view of those most affected. 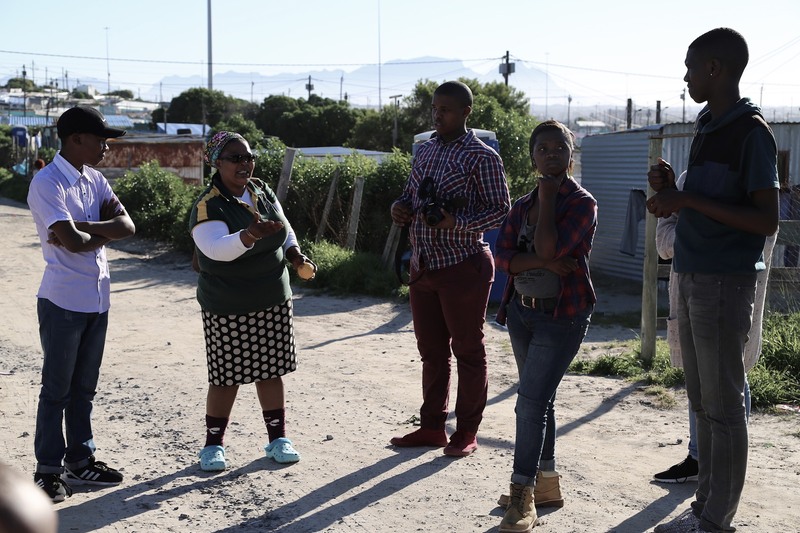 In its three years of existence, the Eh!woza project has evolved into an interesting platform for young people to document their own perspectives on TB as well as that of the community. “We were lucky enough to find mam’Nokhaya outside of her home that morning. We had met her a few weeks ago during the students’ first filming day in the neighbourhood of Nkanini where she told us about the conditions that the residents had to navigate on a daily basis. On the afternoon of our second visit, we were introduced to her friend currently suffering from TB. Her friend’s symptoms were misdiagnosed at the local clinic and her infection progressed from drug sensitive TB to multidrug resistant TB. During this conversation, her friend sat quietly with her hand covering her cheek and mouth. It was an anxious moment for me, always aware of and fearing the reality of infection looming around us while trying to relate to the narrative they were sharing. Mam’Nokhaya was upset about the situation because she believed it was caused by patient neglect at the clinic and in local health care spaces which in turn triggered stigma and judgement of TB infected people. She understood TB as caused by the poor living conditions and dirt that she associated with municipal neglect. But she emphasised that the biggest problem with TB was the unstable relationship between treatment and social welfare support offered to TB patients during treatment. She explained that the treatment drugs required nutrition that many had no access to and that social welfare only provided support for two of the six to twenty-four treatment months. Mam’Nokhaya highlighted the challenges around understanding food insecurity and TB treatment in her township and issues around integrated care. Using the Eh!woza platform, the doctoral research that I have developed works to create a more intimate reflection of how TB illness is navigated.